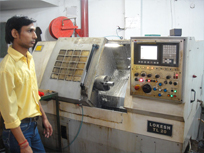 Blending Impeccable Workmanship And High End Engineering, We, At ABC Technologies, Are Constantly Engaged In Manufacturing, Supplying And Exporting Of The Best Performing Range Of sheet Metal Fabrication Products Comprising Of Kiosks, Murals, CNC Turned And Milled Components,Couplers and torsteel bar threading, Sophisticated Tooling & Etc That Can Be Tailored To Your Specifications And Requirements. 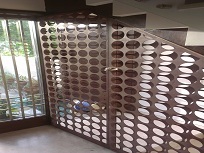 Laser cutting is a technology that uses a laser beam to cut materials, and is typically used for industrial manufacturing applications. 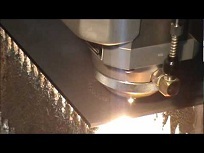 Laser cutting works by directing the output of a high-power laser beam, generated in a resonator and guided on a path with the help of reflecting mirrors and special material lenses, which focuses this beam on the material to be cut. 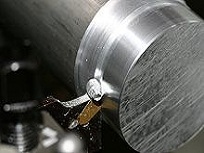 All these parameters starting from generation of the beam till the cutting of material are controlled with the help of a computer. The material either melts, burns or vapourizes with the help of this high energy beam and then is blown away by a jet of gas, leaving behind an edge with a high-quality surface finish. 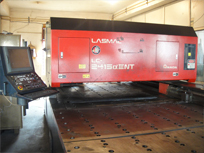 Industrial laser cutters are used to cut flat-sheet materials as well as structural sections and piping materials. 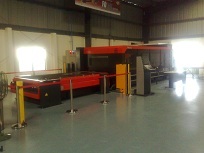 Laser cutting machine can cut almost all metals and non metals under specific conditions. ABC Technologies, an ISO 9001-2015 accredited company, offers a complete and highly skilled in-house Quality Inspecting team, equipped with high end technology equipments. The Quality Assurance team has set quality standard and norms according to which every component is tested to give the optimum performance. 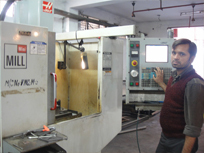 We possess ultra modern machinery and consume the finest quality of raw materials to manufacture unparalleled fabricated sheets metal components for automobile, home appliances, electronics and other engineering industries. Our only business motto is to provide our esteemed clients with high quality products at the most reasonable prices.